...... e. Zune. This tool is very customizable to control the output files: type of graphical file, size of file ("resolution"), pagination, margins, font, color of text, line spacing etc. Also you have ability to save favorite settings and load saved earlier. 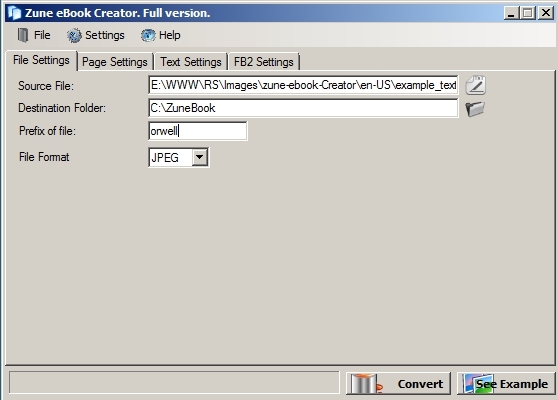 Qweas is providing links to Zune eBook Creator 1.5.3.1 as a courtesy, and makes no representations regarding Zune eBook Creator or any other applications or any information related thereto. Any questions, complaints or claims regarding this application Zune eBook Creator 1.5.3.1 must be directed to the appropriate software vendor. You may click the publisher link of Zune eBook Creator on the top of this page to get more details about the vendor.